Prompt: The meta for this puzzle is a hit from the ’90s. First thing you notice is that it has to be some kind of pattern or aspect in the grid since there are no long/obvious theme entries. Eight letters is the longest we get, and they feature letter patterns that looked so promising that I was unable to solve the meta in the allotted time because of them: AMYMARCH, CLANSMAN, CLAPTRAP, MEEKMILL, INCISIVE, GRAYMARE, and ALL THERE. There had to be a pattern there and in a sense there was a negative pattern, as it turned out, so next time you can’t let go of a promising idea that’s not working out, consider that there might be a pattern there that you won’t be able to appreciate until you approach it from another direction. That’s what I didn’t do here. My grid-scanning hadn’t gotten anywhere, but there was one clue that stood out as being hinty: 36-a. [Ska punk band fronted by Gwen Stefani, and what you’ll have when you find the meta answer] = NO DOUBT. This turned out to be the key to the meta, but after maybe 15 seconds of looking at it I convinced myself it was irrelevant. First, because Pete occasionally uses clues that contain patter, usually for humorous effect or, as I figured was happening here, to take advantage of a fortuitous entry in the grid. He had NO DOUBT, he figured why not emphasize to the solver that when they get the meta they’ll know for sure they have it, makes sense so I moved on. Fast-forward a couple of hours later and I’m going nuts not seeing the pattern so I text a friend who’d already gotten it. He steered me away from my Roman numerals theory (there are a lot of them in the eight-letter entries) and asked if any clues had stood out. I remembered the NO DOUBT one and then, with that prompting, found the idea within a couple of minutes. 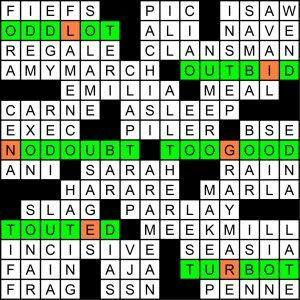 There are six entries in the grid that contain some or all of the letters in DOUBT and where removing those letters leaves you with exactly one unused letter. These six unused letters, taken in order, spell out the 1993 Cranberries hit, “Linger,” as illustrated in the solution at above right. When I first figured out the solution I was underwhelmed, but then I kept discovering new layers of the puzzle’s secrets: 1) when I first got the answer, I thought those six were merely the entries that have exactly one non-DOUBT letter in them — but then I realized that they are the only entries in the grid that contain any of the letters in DOUBT. OK, so that certainly tightens things up a bit… 2) So that’s a reverse letter bank, but with a new wrinkle; instead of not using certain letters at all, you only use them in certain words, which are then later eliminated during the meta. Ah, that’s so clever, because that it made it very tricky to spot the missing letters at all, since they weren’t missing! There are enough DOUBT letters in the grid to completely throw you off the scent. 3) So that’s the reason all those eight-letter words were full of Roman numerals! None of them were theme, not a single one, and they couldn’t use the letters DOUBT. D’s a Roman numeral itself, but few O’s and U’s mean there will be more I’s than usual, and more M’s, C’s, and L’s than usual to make up for the missing T’s. Maybe less of an effect on consonants than vowels there but still enough that I noticed it while solving. 4) The six theme entries are symmetrical, which he didn’t have to do but did and 5) Using the N from NO DOUBT as a letter in the meta answer was an elegant touch, as was finding the musical phrase NO DOUBT, and 6) a song title that’s both well-known and fitting, since the letters linger there after the rest of their answers are eliminated. So this is my favorite Muller Meta of the year so far, and would probably go on my list of Top 5 Mullers of all time and certainly Top 10. You know there’s a pattern in there somewhere because there are no theme entries, but it’s so beautifully hidden under so many layers of elegance that it takes some sly sleuthing to uncover it all. And from a constructing point of view I applaud the to my knowledge totally new idea of a reverse letter bank with meta-relevant exceptions like this. I really wish I had thought of this myself as it’s such a clever and logical extension of the idea and throws the solver off the trail so nicely. 4.85 stars. I’m compelled to point out (as did a few of my solvers) that there is a stray “B” in the puzzle that slipped in as a last minute editing change. I had SOAR/SSE and replaced it with BOAR/BSE to avoid duplicating the SE in S.E. ASIA, and momentarily spaced on the meta mechanism (grrr…). If I ever publish these in a book, I’ll change it back. Regarding BOAR/BSE: I prefer to believe that, much like weavers of Persian rugs, you included an imperfection because only god is perfect. And that meta was perfect. a crosswording friend suggested HRE instead of BSE. I struggled a long time with this one. On a first pass through, I was convinced there were (deliberate) factual errors in some of the clues, which would in some way lead to the meta answer. I was skeptical of the ska punk description for No Doubt, Dr. Dre as a VJ, and how could anyone get arrested for riding a bike without a helmet? I did some researching and one by one they turned out to be true (it’s some other Doctor Dre apparently). Wikipedia says Asleep at the Wheel has 9 Grammys, not 8, but eventually I found sources claiming 8, 7 and 10 also (still don’t know why the discrepancy). Eventually I realized I was way overthinking this meta, and just needed to take “No Doubt” way too literally, a strategy that I usually get to right away. Anyway the struggle just makes the satisfaction greater when I finally solve it. Thanks again Pete for a great puzzle, and Matt for blogging it. A very different Dr. Dre and Ed Lover hosted a rap show on MTV way way back, for those who are curious and didn’t look it up. Kicking myself. Went down the same path. I thought NO DOUBT was just an indicator rather than a theme answer as well. Came up with LIGER. I immediately saw GIRL as a possible (partial) anagram and quickly submitted JUST A GIRL, perhaps No Doubt’s most famous song, before realizing my mistake. Made sense to me at the time, for the same reason as outlined above. Eliminating all those letters leaves “just” *A* (oops) GIRL. Excellent meta as always! Accidentally rated a 3 instead of the intended 5. If someone could please correct, thanks! This one was stellar! Great job, Pete! So I completely lucked into a quick solve. Filled in No Doubt and for whatever reason started in the NE corner. Had “OUTBID” and “NO DOUBT” staring at each other across the grid. Since OUTBID was the only one of the five containing all the letters of DOUBT the mechanism jumped out. As I said – lucky. Almost wish I’d experienced more anguish on this one. It’s so well-done! Rats, between the election and a busy work week, totally missed this one until I saw it was over! Lovely meta. I spent a while staring at NO DOUBT and RAIN and thinking about the 90s hit NO RAIN. But I couldn’t find any other no-less songs in the grid.